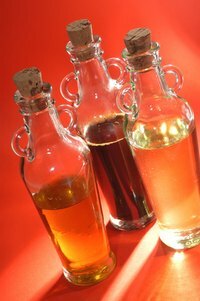 Grape seed oil is recommended for cooking at high heats since it has a high smoke point. While grape seed oil is perfect for cooking, it may cause tough stains on your pots and pans over time. Oil stains can be particularly difficult to remove from the surface of a pan, and high heat may cause the stain to penetrate the metal, leaving a persistent mark. A tough grape seed oil stain can be lifted with the right products and a little elbow grease. Allow the pan to cool completely before beginning the stain-removal process. Measure and pour the baking soda into the mixing bowl. Baking soda is a powerful cleaning agent and a gentle abrasive that will help lift the oil stain. Pour the water into the mixing bowl. Mix together the baking soda and water until you have a thin paste. Apply the baking soda paste to the oil stain. Allow the paste to remain in place for at least one hour. Scrub the baking soda into the oil stain using the soft-bristle scrub brush. Use small circles to massage the paste deeply into the stain. Rinse the baking soda from the pan after you have thoroughly scrubbed out the stain. Wash and dry the pan as usual.